Alongside several unique design features for smooth, seamless and reliable operation and long life-cycle, the industry-leading opening and closing speeds of up to 1,2 m/s and 0,5 m/s respectively and excellent sealing capabilities, help to reduce costs and improve efficiencies. In addition, the doors contribute to lower energy consumption through heat loss reduction and constant interior climate control. The motor is driven by a frequency inverter which ensures a soft start/stop. This function ensures smooth operation, prolonged motor lifespan and subsequent exceptional reliability. 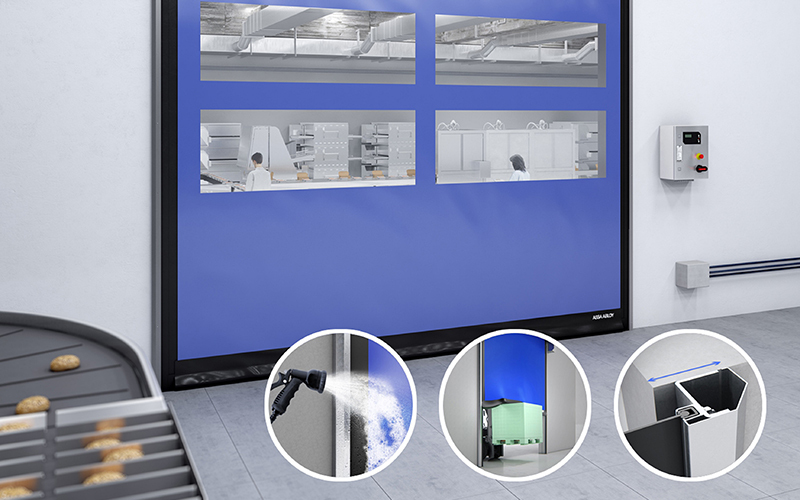 Janssen confirms that the ASSA ABLOY HS9020GHY, constructed with stainless steel, unique side column technology and PVC curtain, has exceptional sealing on all four sides of the door and meets all the hygiene standards for the food and pharmaceutical industry. It is easy to clean and has an impressive lifetime expectation of 1.000.000 cycles. The new, advanced DCS control system incorporates numerous features to ensure worker safety: The soft bottom edge has no rigid parts and moulds around any obstruction to prevent injury or damage. If an object hits the door, the fabric curtain absorbs the impact and releases itself from its side guides without causing damage or being damaged itself. Furthermore, the door is equipped with a breakaway and automatic repair system which ensures that the curtain reintroduces itself after a crash. Janssen points out that in addition to safety, this technology also saves time and costs by reducing downtime and maintenance. The control box is easy to operate and program while the mechanical main switch and emergency stop make it fool proof. The clear display makes a wide range of important information easily visible. Thanks to their compact dimensions, these medium-sized doors take up very little space and can be easily installed in restricted or confined interior spaces. Manufactured from 2.0mm thick PVC and available in eight standard colours, the door curtain can be equipped with windows or vision panels to increase the admission of daylight and visibility. The high-speed doors adhere to all required specifications including wind load resistance Class 1, water penetration Class 2, air permeability Class 1 and thermal transmittance. The doors can maintain optimal functioning in temperatures ranging from 5°C to +40°C. Other turnkey industrial entrance solutions from Maxiflex include a range of industrial sectional doors, vertical-lifting fabric doors for large openings and heavy-industry environments, loading dock equipment, PVC strip curtains, protection screens and impact doors that meet a massive variety of applications across diverse industries – from mining and automotive manufacturing to food and beverage, hospitality and pharmaceutical.